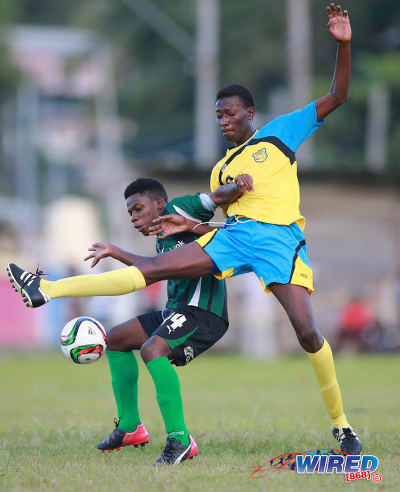 A predatory first half double by St Anthony’s College substitute Haile Beckles was all it took to decide the first 2015 Coca Cola National Intercol semifinal at the Hasely Crawford Stadium today. 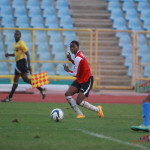 Beckles, who came on for injured left-back Jediael Harewood in the 26th minute, took just nine minutes to make his lightning, quick presence felt, as he latched on to a flick on from St Anthony’s custodian Jabari Brice at the edge of the Carapichaima East area before slamming a low, angled shot past opposing goalkeeper Dejourn Charles. Photo: Carapichaima East Secondary goalkeeper Dejourn Charles looks for the ball after a free kick from Naparima College midfielder Jabari Mitchell last season. 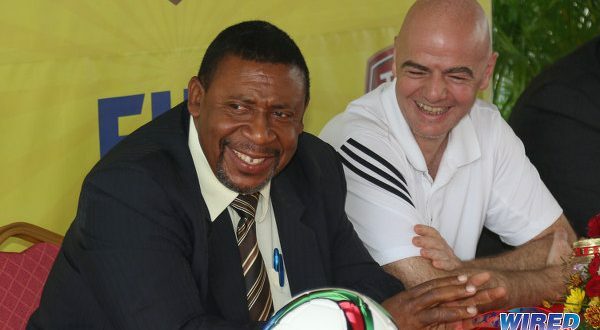 The diminutive Beckles then sealed the contest in the 45th minute, as he squeezed a shot past Charles from close range after receiving a dangerous cross from 2014 Intercol winner Kathon St Hillaire. 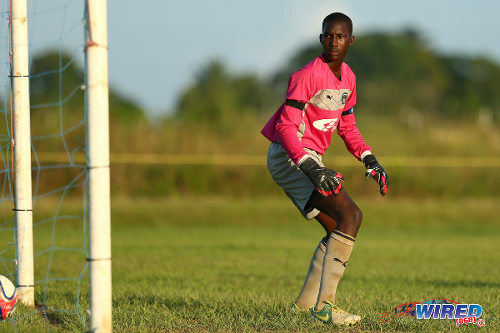 St Hillaire, who won last year’s National Intercol title with Mucurapo East Secondary, now has the chance to make the unlikeliest of repeats with his new schoolmates come next Monday. 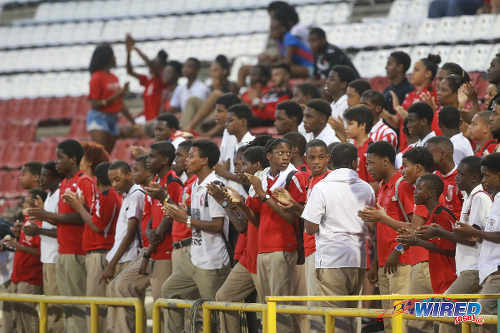 The St Anthony’s performance was not as convincing or as fluent as their North Zone Intercol winning display though, as the “Westmoorings Tigers” often struggled to find their rhythm against a feisty Carapichaima outfit. 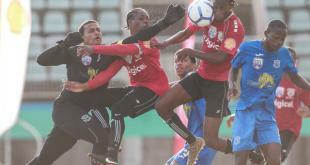 St Anthony’s skipper Simon Joseph showed that he was ready to set an early example for his teammates though, as he forced a fine, flying save from Charles with a free kick from about 25 yards out in only the second minute. Photo: St Anthony’s College winger Kathon St Hillaire (centre) takes St Mary’s College left back Joshua Joseph (left) for a run while coach Ryan Shim looks on in the 2015 North Intercol final. The burly defender then tried his hand at playmaking in the 10th minute, as he slipped a clever pass to forward Shakeem Patrick from another free kick situation. 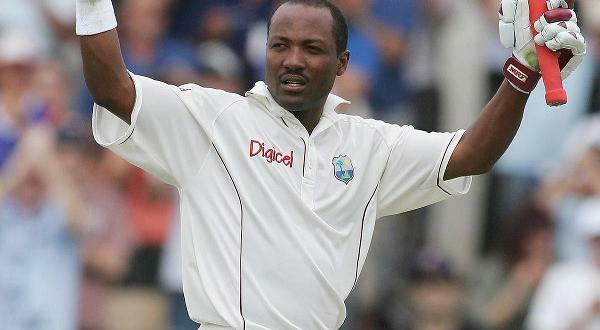 But Charles was equal to the task once again as he tipped the attacker’s shot overbar. Midfielders Nicaya Mahon and Jodel Brown also came close to opening the Tigers’ account inside the first 20 minutes, but both found Charles and the “Caps” defence in their way. 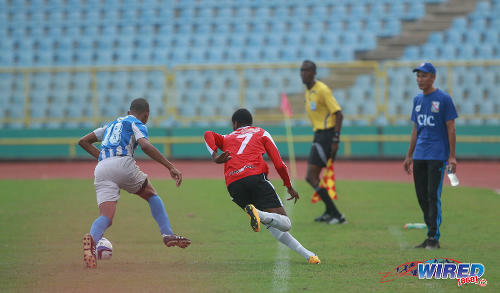 Then came the moment that changed the course of the first National Intercol semi. Carapichaima right-back Michael Williams found himself face-to-face with Harewood on the wing, and he baited the Tigers left-back into a challenge before doing a smooth step over, which led to a rash challenge by the defender. Ironically, Harewood came out on the worse end of the challenge and had to be replaced by Beckles. Some might say Harewood’s tackle had the “perfect” timing. Photo: St Mary’s College attacker Chinua Bernard (foreground) is tackled from behind by St Anthony’s College defender Jediael Harewood during the 2015 North Zone Intercol final at the Hasely Crawford Stadium. Grosvenor laughed, after the match, as he mused over his first substitution. But Beckles was in no joking mood when he came on and immediately began using his speed to hustle the Caps backline. And the forward got his first reward in the 35th minute as he outpaced pocket-sized left-back Jerome Forte before drilling a right-footed shot below Charles. Beckles’ opening item could not have come at a better time too as, three minutes earlier, Carapichaima had their best goal scoring opportunity of the first half thwarted by Brice. Beckles then doubled his tally on the stroke of half time as St Hillaire picked him out in the penalty area after making the most of a failed clearance on the edge of the opposing penalty area by Carapichaima defender Darreon Thomas. 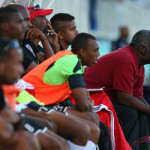 The Kevin Jeffrey-coached Carapichaima team came out asking questions of the North Zone Intercol champs at the start of the second half and manufactured the best move of the game in the 62nd minute when skipper Aaron Kennedy delightfully combined with lively midfielder Colin Wheeler at the edge of the area. 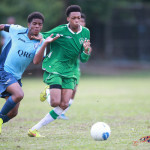 Photo: Carapichaima East Secondary’s Micah Serrette (left) tries to keep the ball from Speyside High School’s Elder Kamarie during 2015 SSFL action in Speyside, Tobago. Grosvenor was not sitting too comfortably in the St Anthony’s technical area. The palpitations increased for Grosvenor as Brice fumbled a corner by Carapichaima substitute Kevon Williams in the 70th minute. But, even with all their possession and endeavour, the Central Intercol champs could not conjure up another clear-cut chance. The dangerous duo of Beckles and St Hillaire both had opportunities to add some gloss to the score line but their efforts failed to trouble Charles. Beckles’ first half double had already done the trick. The Tigers now await the winner of tomorrow’s second semifinal between St Augustine Secondary and Naparima College. 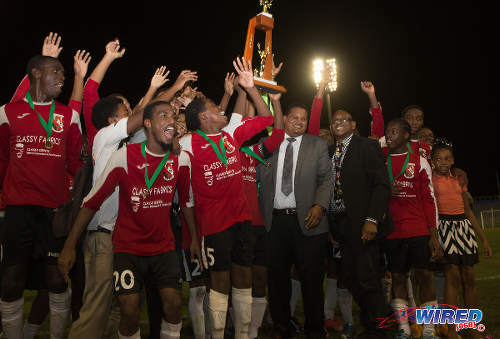 Photo: Sport Minister and ex-St Mary’s College football captain Darryl Smith (centre) and SSFL president Anthony Creed (fourth from right) congratulate 2015 North Zone Intercol champs, St Anthony’s College. 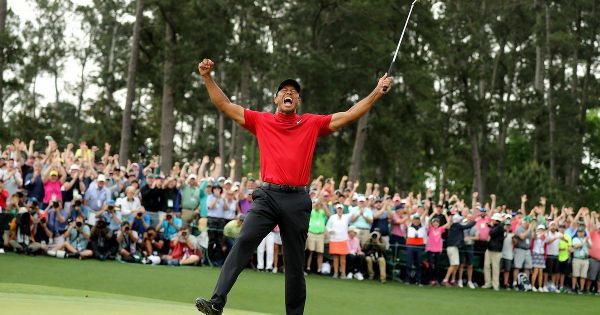 But the verdict is out on which St Anthony’s outfit will show up come next Monday. St Anthony’s College (4-1-3-2): 1.Jabari Brice (GK); 20.Brent Joel (6.Kheisa Granger 46), 15.Nicholas Moyou, 18.Simon Joseph (captain), 12.Jediael Harewood (4.Haile Beckles 26); 14.Nicaya Mahon; 5.Jodel Brown (13.Shem Clauzel 56), 19.Andrew Rullow, 2.Tyrese Bailey; 7.Kathon St Hillaire, 9.Shakeem Patrick. Unused Substitutes: 22.Oba Augustine (GK), 16.Gyasi Moore, 21.Nkosi Salandy, 24.Jaydon Powell. 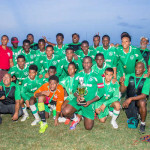 Carapichaima East (4-2-3-1): 1.Dejourn Charles (GK); 23.Michael Williams, 5.Darreon Thomas, 19.Tyeral Fullan (3.Kadiz Chandler 56), 30.Jerome Forte; 7.Mecaheil Alexander , 16.Daniel Pascal; 8.Theophilus Bourne (20.Kevaughn Smith 76), 13.Colin Wheeler, 6.Aaron Kennedy (captain); 9.Justin Joseph (12Kevon Williams 68). Unused Substitutes: 18.Aaron St Clair (GK), 2.Akiem Allert, 11.Gianni Dickerson, 17.Andre St Clair. 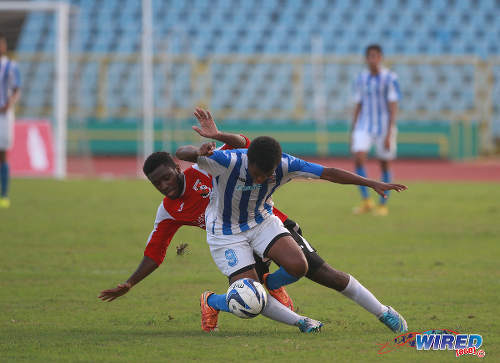 Naparima College v St Augustine Secondary, Mannie Ramjohn Stadium, 3:30 pm. Well done Haile Beckles you have been putting balls in the back of the nets since you were ten years old that’s notting new for you bro so keep shining. Another product of Trendsetter Hawks. Another Trendsetter Hawk Anthony Wickham recruit! Ahhh… Didn’t realise. How is he as a player Roneil K Walcott? 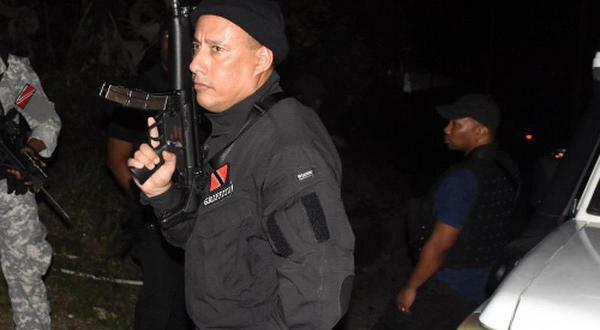 I can just see that he is fast and busy.